Inspired after volunteering at the Cateran Yomp 2017 I have decided to rekindle my skill of paracord bracelet making in order to raise the minimum £400 asked of each participant. As a really unfit human being I have made it my goal to be able to participate and complete the 54 miles so the training starts now. To encourage success I wanted to put in place the nuts and bolts and aim to achieve the 54 miles in 2018 which will be no mean feat. My thoughts are thus: if I can raise the money then ABF The Soldiers Charity will benefit whether or not I fall to bits before the start line, but of course I won’t. Anything from Bronze upwards will be an amazing personal achievement. 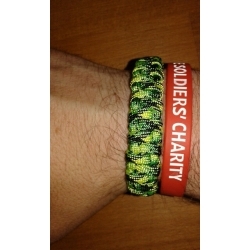 Tipping my hat to 54 miles I aim to hand make a minimum of 54 paracord bracelets in the colour as shown (colours in picture are slightly muted and are brighter in real life) with £4 from each £6 sale being donated to ABF The Soldiers Charity with the total raised donated in May 2018. The rest will cover costs. As it takes time to make each one I will have the bracelets up on the my shop website as a pre-order with an estimated 4 to 6 week turnround so you will be ordering in advance. Best way to size your bracelet is to measure your wrist then add 1 and ¼ to 1 and ½ inches depending if you prefer a snug or slightly looser fit. Please be aware that each bracelet is handmade and not a £50k Vergucci job engineered to be a perfect fit. The paracord bracelet is composed of approximately 8 feet of 550 commercial paracord colour type Gecko with a 10mm contoured fastex military green buckle. Please let me know what size you would like in the comments field when completing your order.